Wilfrid Laurier University’s rivalry with Western is something that brings all the Laurier students together. If you ask Laurier students, they’ll state numerous reasons for why they don’t like Western and why the rivalry exists. For starters, Laurier was affiliated with Western until 1960. The school’s colours, purple and gold, are an extension of the affiliation with Western. Our original colours were maroon and gold, and purple replaced maroon as a sign of honouring the link with Western, as their colours are purple and white. Laurier students like to joke that the purple and gold is superior to the purple and white since the white in Western’s colours looks like silver. With gold medals being seen as superior to silver medals, Golden Hawks never miss an opportunity to remind Western students about who is superior. Another big reason behind Western hatred is the extensive ‘party culture’ in both schools. Laurier and Western are seen as the social pinnacle of Canadian universities and this in itself has added fuel to the fire in terms of the rivalry between the two schools. Above all though, it is perhaps the rich football history between the two schools that makes the rivalry bigger every year. The football rivalry has extended to all the different sports and the games between the two schools have become must-watch material every year. “Our teams always circled the game against Western. Western, to their credit, has been one of the top schools in the country in a variety of different sports. You always want to do your best against the best competition. 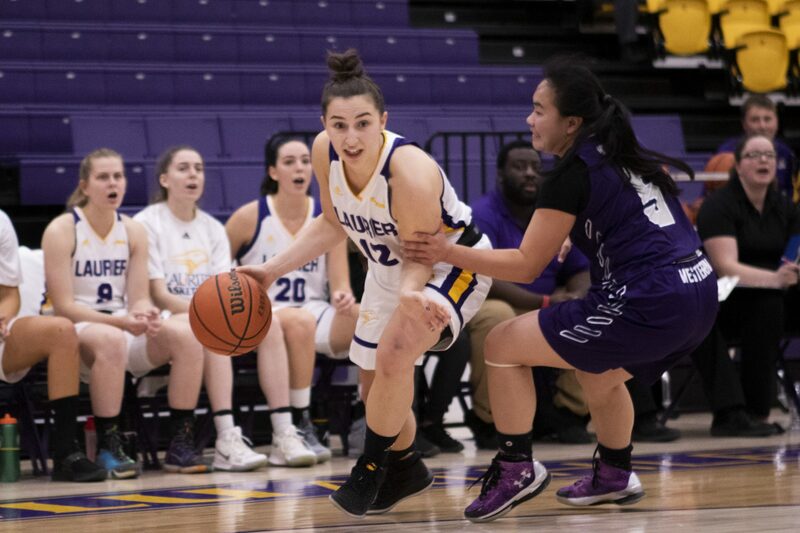 Our teams definitely get up when we play Western,” said Peter Baxter, director of athletics and recreation at Laurier. One of the biggest sports moments for Laurier in their athletic history came in 2012, when the varsity women’s hockey team defeated Western in London to win the OUA championship. At the time, that was the Hawks’ eighth OUA title in nine years and to do it in Western’s stadium made it that much more special. “It’s been a respectful rivalry. When we beat Western for the OUA championship in London for women’s hockey a few years ago, I was asked to hand out the gold medals. It just so happened to be that my daughter [Haley Baxter] was on the team so that was sweet,” Peter Baxter said. The Golden Hawks football team opens their 2019-20 season against the Mustangs at University Stadium here in Waterloo and every single Laurier fan would love nothing more than to beat the Mustangs on opening day. Although all the sports games against Western are exciting, it is without a doubt the football games that make the rivalry special. The Golden Hawks’ football team has played in 23 OUA championship games and won seven times. They have defeated the Mustangs for four of those seven titles. The two schools have met 15 times in the OUA championship and even though Western has held the historical advantage, that does not stop the Laurier fans from supporting their team as shown by their die hard support for the team no matter where they are playing. “We’ve always travelled well. We can make a lot of noise in other people’s building. Everybody at Laurier has an affinity to the Golden Hawk brand. Whether you’re a part of the Students’ Union, Resident Life, everybody wears the Golden Hawk. There’s a sense of pride and an emotional tie. That transfers when your fans are making the effort to travel,” Baxter said. Most Laurier students today remember the magnificent 2016 OUA championship comeback win over Western. The Hawks mounted a massive fourth quarter comeback to overcome a 40-19 deficit to win the 2016 Yates Cup in London. Of course most fans don’t like to remember what happened next year, as the Mustangs destroyed the Hawks in the 2017 Yates Cup final by a score of 75-32. “A few years ago, I hired a guy who used to be the man at Western, Michael Faulds. He was their quarterback and set records for them. There were a few eyebrows raised amongst our own fans when we announced that hiring. I remember talking with Michael at the time and he mentioned how much he respect he had for our program. He remembered coming into our stadium and being a target for our fans,” Baxter added. Coach Faulds has been instrumental in improving Laurier’s varsity football program and even though he used to play for Western, he has garnered the respect of every Golden Hawk at Laurier. The rivalry between Laurier and Western extends to more than just football and it’s something that brings the Laurier community together. No matter the result, that day will add another page to the historical Laurier-Western rivalry which is getting bigger every single year.